Intensity : Which determines how hard a person tries to attain a goal. Persistence: How long a person can maintain the exerted effort to achieve a goal. 2- Motivation differs from one individual to another, and can differ in the same individual in different situations. 3- Motivation includes the study of motivational drives towards achieving goals. In order to be more efficient we will consider mainly the organizational goals and not just general goals. The 1950’s had three contributions of motivation concepts which although are not necessarily valid, yet they form a foundation for other contemporary theories, and managers should be able to recognize the terminology in these theories to better understand employee motivation. The three motivation theories we are pointing at are: The hierarchy of needs, theories X and Y, and the two factor theory. 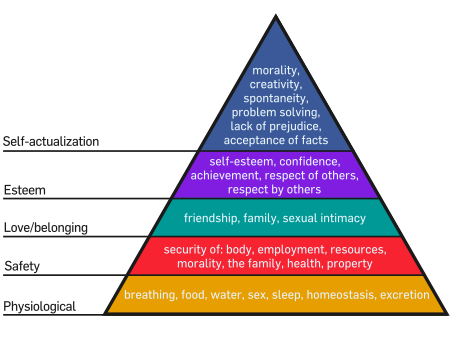 In this part of the article ( Part 1 ) we will take a close look of the Hierarchy of Needs Theory. According to Maslow, if a need is gratified, then it will no longer motivate. So if you are to motivate an employee, you should determine at what level of the hierarchy he/she is currently in, and work on satisfying the needs at that level or at upper levels. In addition, Maslow states that whenever that need is satisfied, it activates a movement to a new upper level. That is, once the need for physiological factors is satisfied, the individual will look for the safety factors,and once the latter are satisfied the individual will look to the social factors and so on and so forth. The same applies on employee motivation. Although this theory received wide recognition however there were no empirical studies that validate the assumptions made. In addition the theory ignores the fact that individuals ratings on needs may vary, some people will actually value the need for self actualization much more than the need of interpersonal relations. Furthermore it is extremely difficult to realize what need in driving an employee at one time.